Widow’s Christian Place: Feeling In The Dark Today? Feeling In The Dark Today? I love the image of the clouds we dread, that are big with mercy, and shall break in blessings on your head. It gives me comfort to know that when we look above those dark clouds there is a beautiful calm sky. Just beyond the storm is Our Lord. "Works His sovereign will" He is solid, perfect, all wise and all seeing. His plan is perfect - although we don't understand and so very often question - there is a peace in knowing He's got it all under control. Is the verse that jumps out at me. Hopefully this week will bring lots of blessings as it is the 6th anniversary of Joe's passing on Saturday. It is bothering me more than what I want it to or think it should. encouraging as there are a lot of changes going on in my life at this time and it can be most unsettling; however if I just remember God is in control and the doom and gloom as I see it is going to be a blessing in disguise. Looking at this picture of the raging storm and high winds imagine if you will . . . Christ being sound asleep in the stern of the ship. The Disciples are fretting back and forth (as we do) awaking the Lord saying . . "do you not care if we parish?" or "do you not care if our hearts are broken?" Lovingly and calmly Christ arose and said "peace be still" at that very moment the winds ceased and there was a great calm upon the sea. Christ asked them why they were so scared and told them of how frail their faith was. If Christ can say in three words "peace be still" and the raging ocean is calm as a sea of glass revealing Christ's complete deity and control, then he can speak to our raging souls, scared souls, souls in pain, our broken hearted souls. 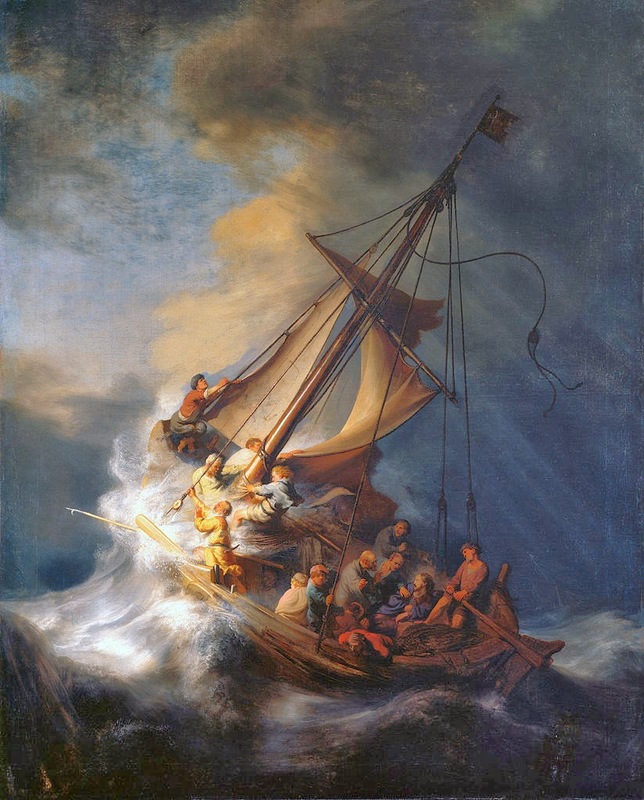 . . "peace be still"
Lovingly and calmly Christ arose and said, "peace be still" at that very moment the winds ceased and there was a great calm upon the sea. My soul reaches out to this phrase from the time of my earliest grief when I prayed for my tears to stop long enough for me to rest from the sorrow of it all. And God granted me the stillness to feel the peace through Christ that afternoon. His Grace was indeed sufficient for me at that moment in time. "rest in the sorrow of it all..." that's grace!